This version of the display is not available anymore. A new version of this display is available. 11 LEDs for shift lights. 4 way POV hat switch. 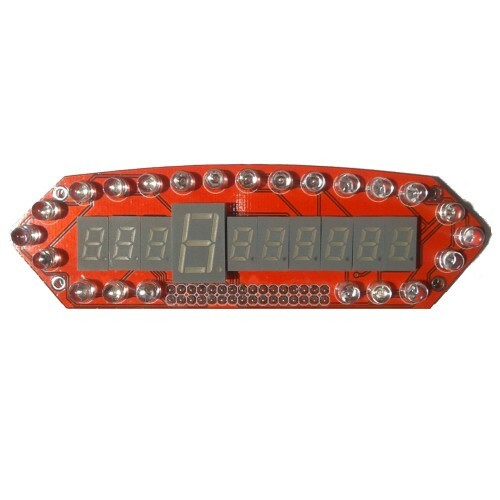 The brightness of the gear indicator display, 3 digits and 6 digits displays and LEDs can be adjusted independently. In particular each LED colour has a separate brightness setting. The Data configuration screen is used to configure what data is associated to the 3 digits and 6 digit displays. Lists 1 and 2 in the picture above associate the data to each display. More data items can be associated to each displays. Buttons marked with 3 and 4 in the picture above are used to change backward and forward what data is displayed. If the checkbox indicated with 5 is enabled, when the displayed data item is changed a small description of the new data is displayed, for few seconds. This section is used to configure the shift lights, the 11 LEDs at the top of the display. Each LED can be configured to turn ON and optionally to blink at 3 different speeds based on the value of RPM. If the checkbox marked with 1 (two pictures above) is enabled, the shift lights will display an alternate pattern when the speed limiter is switched ON (only works with simulators that report the state of speed limiter). Button marked with 2 (three pictures above) opens the Quick Config wizard (picture above), that allows you to quickly configure all the shift lights in one go. 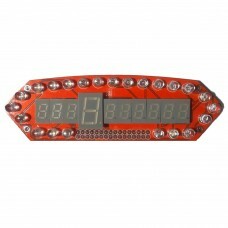 All you have to do is to set the value of RPM at which the first and last shift light will turn ON and the software will calculate the appropriate values for the intermediate LEDs. The other LEDs can be configured in the screen above. Like the shift lights, each LED can be configured clicking on it and the corresponding configuration screen will open. The configuration screen is very similar to the one for shift lights and the only difference is that more data can be associated to these LEDs, not only RPM but also fuel level, water temperature, flags and so on. Toggle switches are two positions switches (ON and OFF). When a digital input is configured to work with toggle switches, a button press is simulated when the toggle switch is moved to the ON position and another button pressed is simulated when the toggle switches is moved to the OFF position. The Polling Interval settings determines how often the inputs of the controllers are read. The default value is 20 ms, which is usually fine if you are only using push buttons. The reason why you don’t want to read the state of the buttons too quickly is because when a button is pushed it normally bounces for some milliseconds and if these bounces were read by the controller more button pushes would be reported. Instead, reading the state of the buttons every 20ms guarantee that the bouncing has stopped. If you are using rotary encoders, 20ms between one reading and the following could be too long if you rotate the encoder very quickly. In that case the polling interval can be reduced to 15ms, 10ms or 5ms. Buttons are connected to a 6×4 matrix, like in the picture above. Each button has one contact connected to a COLUMN and the other contact connected to a ROW. Diodes are NOT required if you don’t connect rotary encoders or toggle switches and if you don’t expect to press 3 or more buttons at the same time. (if you press 3 or more buttons with no diodes, button presses are not decoded correctly is some cases). The central pin of the rotary encoder is connected to one of the ROW pins. In the picture above the central pins are connected to ROW 1. The other two pins of the rotary encoder connect to COLUMNS 1 and 2, or to COLUMNS 3 and 4 or to COLUMNS 5 and 6. Diodes are often necessary when using rotary encoders but now always. See below when diodes are required. In the picture above the first rotary encoder replaces Buttons 1 & 2. The second rotary replaces Buttons 3 & 4 and the third one replaces Buttons 5 & 6. Only push buttons are used (no rotary encoders or toggle switches). If rotary encoders and/or toggle switches are being used,they are connected to only ONE ROW of the input matrix. 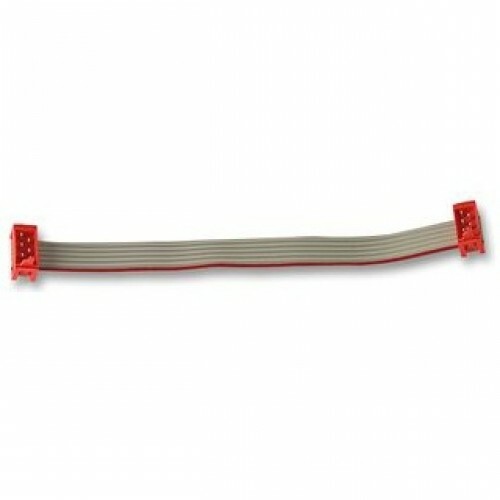 If you have connected push buttons as well, push buttons, rotary encoders and toggle switches are connected to the same ROW of inputs. Only ONE row is used. In all the other cases, diodes must be connected between the pins of the rotary encoders/toggle switches/push buttons and the COLUMN pins of the Pro-Race display. If you think connecting buttons and rotary encoders this way is too complicated, have a look at the button adapter.